"Hey. I'm Saul. That's me getting hit in the face." Comics have taught us that superheroes have to bring with them a series of specific traits that make them capable of saving the world on multiple occasions. There's all sorts of cliche about the notion, but few of them look at being a hero as a "job" as opposed to a calling. Hero Hourly #1 from 21 Pulp is just that. The issue is written by James Patrick, penciled/inked by Carlos Trigo, colored by Alex Sollazzo and lettered by Ed Dollman. It's getting harder and harder to come up with superhero tales that feel fresh, but bogging superheroes down in the minutia of daily life seems to be an approach that a lot of writers are taking. That tedium is what Patrick relies on in Hero Hourly #1 to make it feel so fresh. Saul is presented as a character with seemingly everything going for him, which includes great job prospects and a massive ego to go along with them. His "fall" is that much more entertaining because of the characterization, as Patrick essentially commoditizing the superhero profession and is forced into a role akin to that of an entry-level position. The way the first issue is structured blends together narrative and information in a way that affords Patrick some flexibility in terms of the tone. The characters in Hero Hourly #1 boast sharp angles and strong features. Trigo's style is a blend of superhero and caricature that feeds into both aspects of the comic very well. Every character is filled with a sense of arrogance that falls into place with Saul's general smugness about everything and adds another layer of humor to an already funny issue. The panel layouts are largely presented in a standard grid format that keeps the action moving along cleanly. Sollazzo's colors are bright and vivid, providing superheroes in a standard yellow uniform that pops off the page. 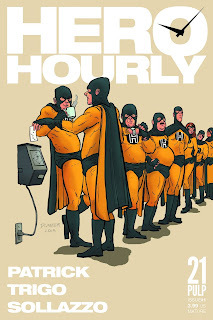 Hero Hourly #1 is a fantastic first issue that offers a great new look at the appeal (or lack thereof) of being a superhero. Too many superhero tales stress the "importance" of being a hero (Deadpool anyone) and Hero Hourly #1 looks at the concept as more of a necessity. Patrick's script is very self-deprecating of the industry as a whole and is pretty damn funny. Trigo's artwork is a great fit that furthers the relatively lighthearted tone of the book. Hero Hourly #1 is quite frankly a lot of fun and a huge breath of fresh air for an industry dominated by capes and tights. 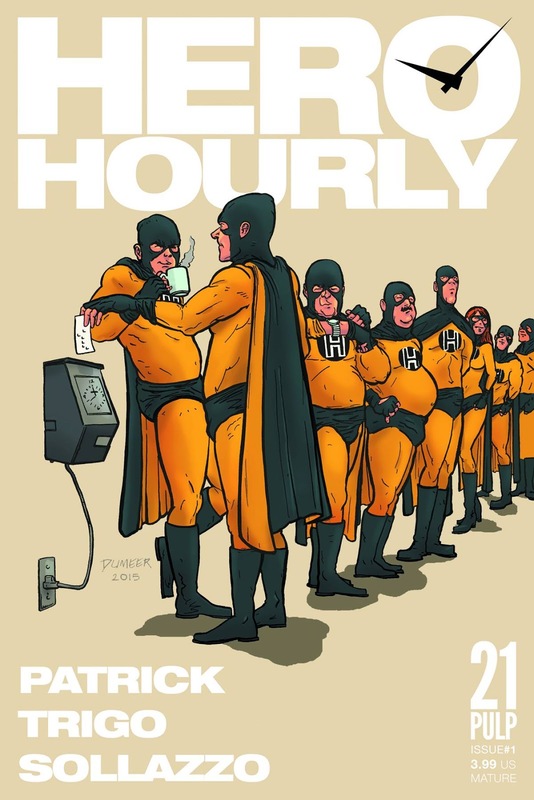 Hero Hourly #1 is available now.